It's easy to get started with the Healthy Eating Guide. Healthy eating increases your food choices, and this site is all about your taste and your choice! You already have a natural inborn taste for healthy foods. You can develop and cultivate your taste by trying new foods, embarking on food adventures, and just a little planning. Every time you seek out a food or try one at random, you break out of a food rut and break through to the possibility of new habits. This allows you to change and improve, and is fun. Order something unfamiliar in an ethnic, gourmet, or natural foods restaurant. What food have you always wanted to taste? How could you find it? For example, these were the foods that I always wanted to try: swordfish; mangos; fried plantains. Natural food stores have healthier food options and often carry different and unusual foods. Find one near you through the online Eat Well Guide. Who is your friend or relative who knows the most about food? Ask them to share an unfamiliar food or dish with you. Discover new foods and tastes online. There are many excellent sites, such as Simple Italian Cooking. Google for "easy" and "simple" along with the cuisines that interest you. Pick out an unfamiliar recipe or technique from your favorite cookbook. Or, browse for a cookbook that interests you. Bookstores usually have a good selection of ethnic cookbooks. Any of the books recommended on this site have unusual recipes and techniques. Beyond restaurants and stores: Healthy Eating Guide food adventures. Go to a farmers' market, where local farmers sell produce. Urban areas typically have farmers' markets at least one day a week in season. According to the USDA, there are almost 5,000 farmers' market locations! The most daring food adventure of all might be to contract for a season's worth of variable produce from a local farmer. Grass-fed meat, from pastured livestock, has a healthier nutritional profile than conventional corn- and soy-fed livestock. The healthier meat reflects the animals' healthier food and activities. Also, the livestock are not stressed, confined, and abused, which alone could be a reason to prefer this meat. Eat Wild has a directory of local farmers and mail-order grass-fed meat. Raw milk, fresh from the cow, is a popular health drink. Raw milk contains its natural proteins, fatty acids, vitamins, minerals, and enzymes, all of which are degraded by milk processing. Raw milk isn't easy to get: here's how to find it, on Real Milk. Some planning and thinking ahead helps create healthy eating habits. A healthy eating guide wouldn't be complete without a few ideas about planning ahead. Always have healthy food around the house—both ready-to-eat and supplies for meals. 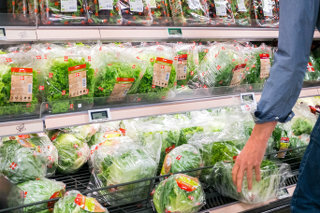 On your next shopping trip, stock up on healthy foods that store well. Take a moment to clean celery sticks, hard boil eggs, and so forth, so that there is always something ready to eat. Plan a pantry of storable healthy foods. For example: popcorn, rice, beans, nuts, dried fruit. Don't keep anything that's too old. Don't keep stocks of junk food. Ideally, don't keep junk food around the house at all. This forces you to go out, in a specific decision, for every junk food item that you eat. Make a commitment to preparing more food at home than you did before. For understanding and appreciating healthy eating, there is no substitute for preparing your own food. When making meat for dinner, make enough for more than one meal. Leftovers and other healthy foods that store well are excellent for bag lunches. Many leftovers can be frozen for later meals or lunches. For a bag lunch, simply move the wrapped, frozen cooked meat from the freezer to a lunch bag in the refrigerator the night before. What healthy eating, shopping, and cooking habits would you ideally want to have? List them and post on the refrigerator. I hope you'll find this site extends the Healthy Eating Guide with more ideas. Let's join in a spirit of fun and adventure in all things food!